A new visa policy recently announced by the U.S State Department has put the Confucius Institute under the spotlight in the Chinese blogosphere. The new directive, issued on May 17, 2012, demands that university based institutes obtain American accreditation in order to continue to accept foreign scholars and professors as teachers. The new regulations may result in the termination of visas for hundreds of teachers, as more than 60 universities in the US play host to the Confucius Institutes. 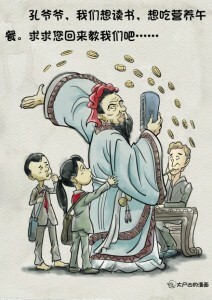 On the other hand, Chinese netizens wish that the Confucius could return home to teach poor Chinese kids. The Confucius Institute is a government sponsored cultural outreach program which aims at promoting China's Soft Power globally. It is affliliated with China's Ministry of Education and run by the Chinese National Office for Teaching Chinese as a Foreign Language or Hanban. The first overseas Confucius Institute was established in November 2004 and by August 2011 there were more than 826 Confucius Institutes and Confucius Classrooms worldwide. Although the Chinese government is unhappy about the directive, the majority of Chinese netizens are in celebratory mood. Da Shi Xiong's cartoon is the best expression of the online popular sentiment, with the children in the picture begging Confucius to return home to teach. The government has spent so much money to run overseas Confucius Institutes and provided so many opportunities for some people to put money into their own pockets. Why doesn't it spend the money running Hope Schools and developing our own elementary education? Some people are angry about the US government expelling Confucius Institute teachers. However, let us take a look at the game played by the Institute – the Red officials are using the Confucius Institutes to apply for Chinese government funding. The offspring of these officials can then teach in the Institutes with a simple objective – to use the taxpayers money to get their green cards. They just pretend to uphold and promote Confucian ideals but they have a hidden agenda. The Red officials are powerful enough to destroy Confucius after 2,500 years. I am thankful to the Americans for stopping the Confucius Institutes and saving our hard-earned money. Blogger Cai Shenkun provided more background about the resentment that people feel towards the Confucius Institute in his blog at ifeng [zh]. According to official reports, the construction cost of each Confucius Institute is about five million US dollars. Each Confucius Classroom costs about 60 thousand USD. Xue Yong, who is now based in the U.S, estimated that it takes a few million US dollars to set up a Confucius Institute. The Institute offers courses such as Chinese Culture, Tai Chi, Chinese Language Test. Sometimes they even sponsor foreign students to travel to China. Apart from the construction of the Institute's building and classrooms, there are operational costs. Hanban China  would allocate at least 50 to 100 thousand USD as a start-up fund for each Institute. It has been estimated that at least 25 to 50 million USD have been spent for this purpose. In addition, they have to pay for more than 4,000 full-time teachers and 3,000 volunteers to work overseas. Each volunteer receives one thousand USD subsidy per month for one year. Our government has spent 36 million USD just on the Institute's volunteers annually. There are also different kind of project funds which have no clear record of the amount spent. How much money has the Chinese people spent on Confucius Institutes annually? We don't have any official figures yet. However, in 2008, their budget was up to RMB 1.6 billion and the amount keeps increasing every year. After more than 20 years, Project Hope has only managed to raise RMB 5 billion. However, our government is pouring money into subsidizing foreign education, much more than is reserved for Project Hope. How are taxpayers supposed to react to this? Even more incredible is that in 2010 the scandal [zh] of the most expensive website [in China], the Online Confucius Institute, was exposed to the public. The winning contractors demanded RMB 32.5 million (about forty million USD) for operational costs of the website. The media later reported that the contractor was ‘Wuzhou Network’, the legal representative of which is Wang Yongli, who is also the deputy chair of Hanban. This means that Hanban has contracted out the website to itself, and through the process RMB 30 million have been channelled into someone's pocket. If the news of the tender had not been released via the website of the Finance Ministry, no one would have known of the Institute website's operational costs. This post was sub-edited by Jane Ellis .